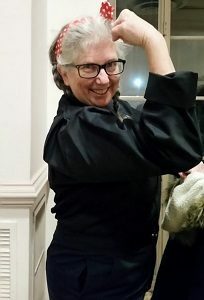 On July 1, the Youth Orchestra of Bucks County will experience a major shift: After approximately 18 years of service to YOBC, Diana Nolan will retire from her job as…And therein lies the question: What is Diana Nolan’s job? Or perhaps more to the point, what is NOT Diana Nolan’s job? Her official role is office manager, but to the parents, student musicians, and staff of YOBC, she has earned a loftier title. “I call her the Knower of All Things,” says Amy Wilkowski, whose son Ryan is in the Wind Ensemble. Her work includes – but isn’t limited to – managing the website and database; coordinating auditions; writing, editing, and publishing Keeping Tempo; sending out regular weekly news and information emails to the community; publicizing the concerts and other YOBC events; and handling such development work as tracking donations and sending out acknowledgments. All this started back in 2000 when, as an innocent newbie parent, she agreed to do, ahem, a little volunteer work. First she coordinated concert volunteers, handled ticket sales, and managed sound recordings. Then she began the herculean task of coordinating auditions. “Diana is the perfect example of a volunteer who creates and performs a job so well, that when she decided to move on, the organization simply couldn’t allow it to happen,” says Joe Hochreiter, Jr., YOBC board member. Instead, YOBC snapped her up as a staff employee. In those early days, the organization relied on a phone chain to get out information, recalls Eileen Wachtman, a former board member. “We were doing postal mailings for all registration, music, and information regarding concerts,” says Wachtman. “Diana was integral in bringing us out of the ‘stone age.’” She helped create the first website and moved the organization online for registrations and other information. And she does it all without cracking a worry line. “She just has a calming air,” says Heather Menci, whose son Wyatt is in Wind Ensemble and Philharmonia. “She always makes everyone feel welcome,” adds Ingrid Daubert, who has two daughters in YOBC. What’s her secret? “Diana is one of the brightest, most organized women I know,” says Sue Busch, YOBC volunteer coordinator. Dori Clough, former YOBC board member, agrees wholeheartedly, calling Diana “a very well-organized, well-spoken and dedicated representative of YOBC.” Her skills at keeping organized have even rubbed off on others. “She has kept me on task and on target in so many ways,” says Steve Sweetsir, conductor of Fanfare Winds. Best wishes, Diana, Knower of All Things!